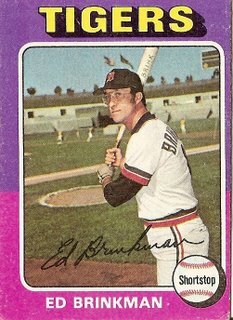 The style used by Topps in 1975 often seemed to produce cards that were off-center, the bordering almost always thicker on one side than the other, as if the process of making the cards was not standardized and mechanized at all but instead one that relied on the judgment and dexterity of a 19-year-old Coast Guard dropout named Smitty who just spent his break smoking a joint out by the dumpster. In general, the mistakes riddling the 1975 set made the universe captured by the cards seem to my seven-year-old self to be homely, disheveled, approachable, as if my personal Mount Olympus was barely less tangible than a bake sale advertised by a mimeographed page tacked to a bulletin board at the Price Chopper. The off-balance layout is apparent in this card, which further lessens the feeling of distance between the viewer and the realm of major league baseball by presenting a figure who seems to have called in sick to his job as an instructor of remedial math and driver’s ed at the vocational high school to sneak onto the grounds of the Detroit Tigers’ training complex. The distance lessens further still with the discovery that this bespectacled ectomorph turns out not to be an imposter at all but a starting major league shortstop; moreover, he has been a starting major league shortstop for well over a decade. He even has his own crudely personalized bat, which he presumably used in the just-concluded season to launch 14 home runs, his career high. I have to go right now if I’m going to catch the commuter train that drags me to my job proofreading educational testing materials; otherwise, I might be tempted to engage in the vice of making nostalgic claims, such as that the world seemed wider back in the days when Ed Brinkman was possible. You are currently browsing the archives for the Ed Brinkman category.